What do you get when you combine music, and werewolves? Aside from the greatest heavy metal band in existence, you get Kitty Norville. 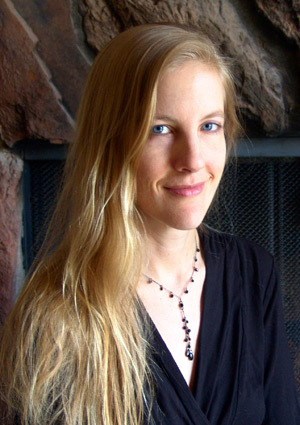 Carrie Vaughn is the author of the highly popular Kitty series, The Voice of Dragon novel and even an author in George R. R. Martin’s Wild Cards universe. Recently I got the chance to interview the author. With your Kitty Norville series you have taken a very serious look at the lycanthrope mythology and even added some of your own brutal element to it. When you prepared for this series how much research did you do on the werewolf myths? I did less research on werewolf myths and more research on actual, biological wolf behaviour. Starting out, I took the basic Hollywood werewolf myth and built on that, because that’s what most people are familiar with. That was the “myth” I wanted to comment on, and by adding what I learned about wolf behaviour, making my werewolves more like actual wolves than CGI monsters, I was able to add a realistic dimension that gave me a lot to work with while writing the stories. From the setting of a radio host to the song list you insert into the book, its obvious music plays a big part in your life. How does music influence or affect your writing? I like music a lot and I’m usually listening to one thing or another. I listen to music when I write, because it distracts the list-making, obsessive part of my brain and helps the creative side. I include the playlists in the book because Kitty is a DJ — it fit. I probably wouldn’t have, otherwise. The songs I include on the playlists are ones that catch my attention while I’m writing the book, ones that seem to suit that particular book because of tone, lyrics, whatever. I have a good time putting them together. I’ve had short stories that really came together when I listened to the right kind of music. Where did the idea of Kitty come from? 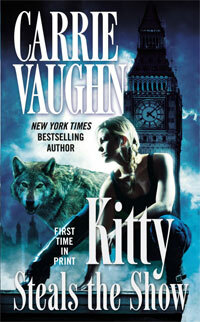 Where did you draw inspiration for the werewolf named after a cat? I decided that if there really were vampires and werewolves in the real world, Dr. Laura and Dr. Phil wouldn’t be able to solve their problems, so they would need their own talk radio advice show. 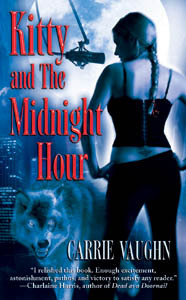 I made the host of this show a werewolf because I wasn’t interested in writing about a vampire, and making her human seemed boring — plus, how is she going to comment on supernatural problems if she isn’t supernatural? Calling her Kitty was just icing on the cake. Once I decided to call her that, I couldn’t call her anything else. You have been published in the Wild Cards verse. What was it like working with George R. R. Martin and playing in his world? I’ve been a fan of Wild Cards almost since the beginning. I started reading the series in the late 80’s, when I was in high school. So getting to write for the series is a dream come true. I’ve been calling it writing professional fan fiction. George is a talented editor, and putting Wild Cards together — gathering so many writers and ideas and making a cohesive story out of their input — is a rather Herculean task. He manages to strike a balance between letting the writers have their says, but keeping us on track so we can actually finish the books. What in Kitty’s mind, the worse thing she’s ever eaten as a werewolf? James, in the first book. Up next are my two 42 Webs ‘signature questions’. There are small questions that while growing up I always wondered about authors? Feel free to answer one or both. What is your favourite book/author? Why? The book I keep answering this question with is The Blue Sword by Robin McKinley, because it’s the book I’ve reread the most — every year or so since I was fifteen. It’s a book that’s custom-made for a slightly misfit, horse-crazy fifteen year old girl, like I was. Reading it is like hanging out with an old friend. What is your most memorable comic trade/graphic novel? Why? Marvels, by Kurt Busiek and Alex Ross. First, the artwork is beautiful. It raises the bar on what superhero comic art can do (and I’ve loved watching the way Ross’s artwork has influenced the current run of movies — that shot in Avengers, of the waitress looking out through a window while the battle above is reflected on glass, is pure Ross). I love the “person on the street” story, how it isn’t a superhero story so much as a story about how superheroes leave their mark on society. This entry was posted in Books, Panic View and tagged author, book, carrie vaughn, geek, george r. r. martin, kitty norville, wild cards. Bookmark the permalink. Saved my live with this weblog, I was so bored!